DO YOU KNIT OR CROCHET? OR SEW? 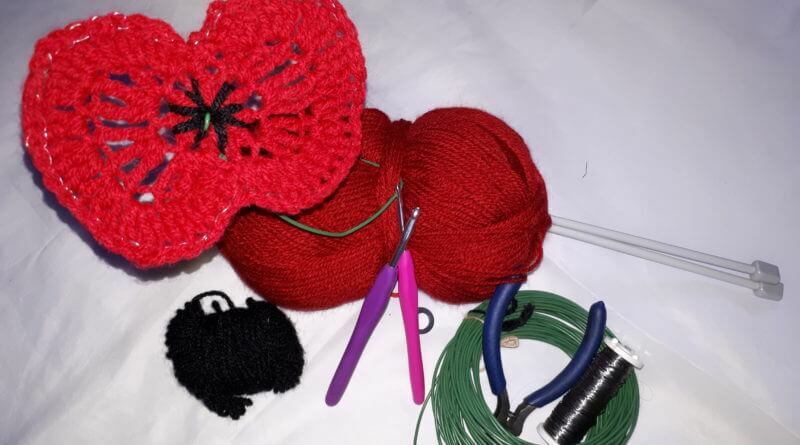 On 11th November I will be constructing an installation of knitted and crocheted poppies, one for each Belper soldier lost in WW1, plus a few extra, in the Memorial Gardens. The poppies will form a centrepiece for the Belper in Wartime and World Heritage Site marking of the Armistice Day centenary. Other areas within the World Heritage Site have wanted to get involved, and I have given them patterns and advice. But I need your help to get this done in time. We have 2 months to go and I need an army of crafters to make about 300 poppies between us. I need 260 large poppies (12cm length) and about 40 small ones (9cm length). They all need to be red. The poppies themselves only take a few minutes to make. The wiring takes about 10-15 minutes more. A beginner will need about half an hour to make one. Below are the patterns which I have been giving out to volunteers. I favour the two petal poppy that is recognisable as a symbol of remembrance, due to the Royal British Legion using that form. I’m not being a stickler for form though. You can use any pattern you like as long as it isn’t fancy and frilly. If you need to talk to me, have poppies to hand over, or want a demonstration of how to wire the poppies, you can give me a call on 07881 284805. If you don’t feel that you can wire your poppies, then by all means just make the poppy and I will wire it. I need to recieve all the unwired poppies by 31st October. For support, chat, sharing or to see how things are going, come and join the Facebook Page for Belper’s WW1 Poppies. Please, come and be part of a huge craft project for the WW1 centenary. Working patterns for poppy project. Crochet: Two petal poppy to match Royal British Legion poppies. Rnd 2: *ch1 dc ch1 2tr in next st, 3tr in next st, 2tr ch1 dc in next st, slst in next 2sts. rep from * once again. Rnd 3: *ch1 3dc in next 2 sts, 2dc in next 5sts, 3dc in next 2 sts,slst in next 2sts. rep from * once again. Fasten off of not wiring edge. Wiring edge/Rnd 4: with 0.4mm jewellery wire, sl st each stitch, fasten off, then flatten wire loops and shape. Wire stem and black centre: Thread loop of garden wire through centre and back through stitch nearest centre. Tightly wrap spare wire under poppy head to keep it in place. Sew 2-3 strands of black wool across each section of poppy centre to create poppy pod pattern. And then through and around garden wire and black under stitches until poppy head does not flop down against stem. These wires will be taped to garden sticks over the whole length, so don’t worry if they get bent. If you aren’t confident that you can do the wiring, just get the poppies to me by the end of October and I will do it. Break off yarn with long tail and thread back through remaining stitches and pull tight. Using B, cast on 16 sts. Cast off. Coil into a tight spiral and sew base to the centre. with 4.5mm hook Ch 3, join with sl st to form circle. Ch 3, work 9 dc into the centre of the circle and join with sl st.
Work the three petals separately. Ch 3, work 1st dc into same st, work 2 dc into each of the next 3 sts. ch 1 work 2 sc into each st, tie off. work 2 dc into last dc of previous petal, work 2 dc into each of the next 3 sts. Work petal 3 as 2. Sew all ends in and attach button in the centre. Hi, I will have a go at knitting some poppies. where do we get the wool wire etc. please? I expect you will want everyone’s to be the same.